In response to the European Union’s call for voluntary pledges for the uptake of recycled plastics, Thrace Group submitted a pledge to substitute more than 8,500 tons of virgin raw material with recycled by 2025. This pledge is Thrace Group’s contribution to the Commission’s objective to significantly increase the quantity of plastic waste that will be converted into new products by the year 2025. 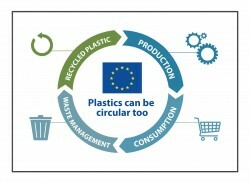 Totally aligned with the “European Strategy for Plastics in a Circular Economy” that demands all plastic packaging placed on the market to be recyclable or reusable by 2030, Thrace Group already produces and distributes recyclable products. Within this context Thrace Group is increasing its investments in the research, design and manufacturing for light weight, recyclable packaging solutions and innovative technical fabrics.